Back in the spring on 2013 I acquired a 1986 Transformers: The Movie Ziploc Promotion Salesman’s Sample Kit. In that review I noted that I did not have a sealed box of the bags and was looking for one. What I did not say was that it was on my list of Holy Grails for my collection. I admit to having quite a few, and maybe I’ll do a blog about them some day. Some might surprise you, and most of them I’m never going to find anyway, but after what happened a couple weeks ago, who knows? Out of the blue about two weeks ago, I got a tweet from someone who saw said they had a sealed box of the 1986 Transformers Ziploc bags for sale. Obviously, you have to wonder if it’s all on the up and up when someone you don’t know contacts you online. This isn’t like something that was up on ebay. They sent me pictures, and they weren’t any pictures I’d seen of the bags before. The price was reasonable, in fact, I would have paid more, so I took a shot and sent the Paypal payment. A couple days later they sent me a tracking number. I must admit, I was trying not to get too excited. A few days later this arrived in the mail. I never thought I would find it. I’ve never even seen one in the flesh before, just a flattened box at Botcon 2006 that was part of the Hartman’s collection that was being sold. It was sold before I got to it. What I found really interesting was the note that came with the box. Apparently, they were cleaning out their grandparents’ house to be sold and found it. It almost ended up in the trash. Can you imagine? 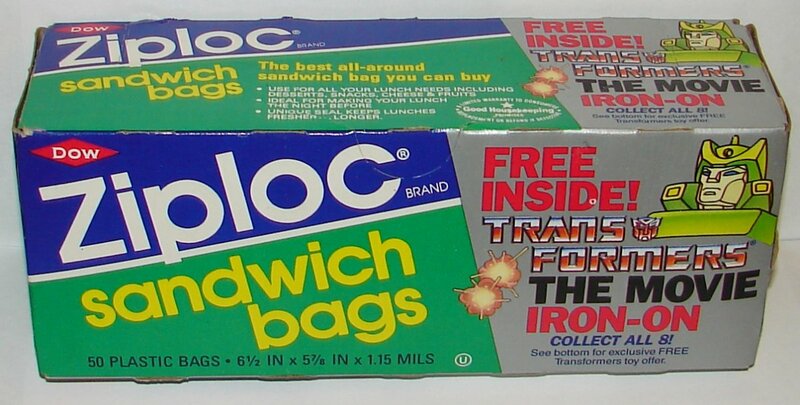 A thirty year old box of sandwich bags still in someone’s cupboard? Even more amazing, the person who unearthed it realized it might be something someone would want and found my blog. Well, I guess I proved that one wrong. 🙂 But I’m still keeping my Transformers Ziploc bags. As always, you can find over 9000 Transformers merchandise items and collectibles at TFMuseum.com. I have not done an update to the site in a while. Hopefully I will be doing a major update this spring with more than 2500 new items including a huge number of Age of Extinction items. This entry was posted in Toy Reviews, Toys, Transformers and tagged Iron-On, Toys, Transformer Iron-On, Transformers, Transformers: The Movie, Ziploc, Ziploc Sandwich Bags, Ziploc Transformers Promotion. Bookmark the permalink. I think the drill is the best of the Powerdashers, but that is not saying much. Omnibots were so much better, no question. Wow, didn’t know they had a Powerdasher free with only three Ziplock UPCs. The Reinforcements offer was $3 and two Robot Points. Lousy toy, but at least it was a “real” Transformer.